WHICH OF THESE WATERMELON DRINKS WOULD YOU TRY FIRST? - What About Watermelon? You are here: Home / Recipes / WHICH OF THESE WATERMELON DRINKS WOULD YOU TRY FIRST? As the holiday season settles in, I can’t help but smile when I think of the many festivities that the next month will bring. Of all the Christmas traditions that exist, holiday parties have become a popular and enjoyable way to ring in the season. Family, friends and coworkers come together in their best (and worst) festive sweaters to partake in a long-standing Christmas tradition to eat, drink and be merry (emphasis on drink!). This holiday season, I’ll be celebrating a lesser-known-but-equally-important holiday known as Repeal Day. Celebrated each year on December 5 (that’s today! ), Repeal Day marks the 1933 end of the 14-year national ban on alcohol known as Prohibition. The best part about Repeal Day? It’s so easy to celebrate! Just grab your favorite alcoholic beverage, and you’re already exercising your right to drink and be merry! In observance of Repeal Day, below are a few watermelon-flavored beverages and watermelon-inspired recipes for those who are both naughty and nice. Hell or High Watermelon wheat beer – What better way to celebrate Repeal Day than with a cold, refreshing can of American rights? 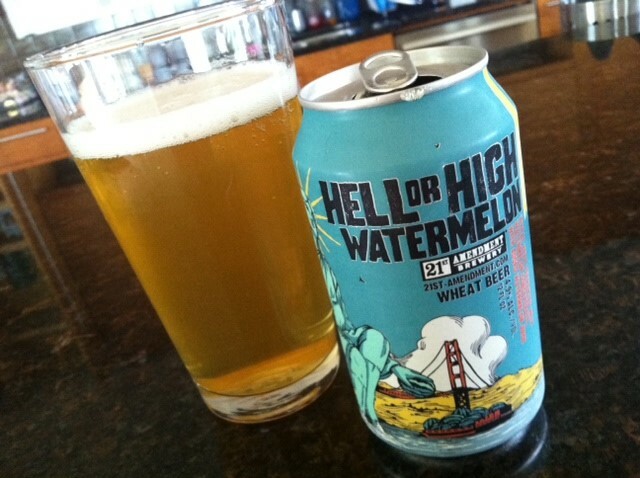 This light wheat beer is infused with flavors of watermelon. Jack Daniel’s Watermelon Punch – In a perfect marriage of Jack Daniels and my beloved watermelon, the whiskey giant has a winning malt liquor beverage perfect for any holiday get-together! Bacardi Grand Melon – How many watermelons does it take to make a bottle of Bacardi Grand Melon? I don’t know, but it sure tastes good! Watermelon Snowball – This sweet and simple cocktail is perfect for the snowy days ahead! Watermelon Champagne Sangria – We’re putting a new spin on an old favorite with this recipe for Watermelon Champagne Sangria. Pairs best with a fireside night…and watermelon, of course! Jolly Rancher Martinis – Spice up your office Christmas party with Watermelon Jolly Rancher martinis! Big Breezy – Definitely the most interesting option on the holiday cocktail menu, the Big Breezy has something for everyone. For more drink recipes using watermelon, check out the “Cocktails” section of the National Watermelon Promotion Board website.